Oh yes, ‘that time of the year’ is finally here! And also yes, I’m absolutely no grinch – I’ve been loving this wonderful time of the year since I’ve been a little child. There’s simply something magical about the Christmas time, deliciously scents of cinnamon and mulled wine in the air, fairy lights and Christmas markets, cookie crumbs in the kitchen, Christmas classics returning to TV, families get together, kids are super excited for the big day (totally counting myself into that category! ), it’s simply a wonderful time in my books. 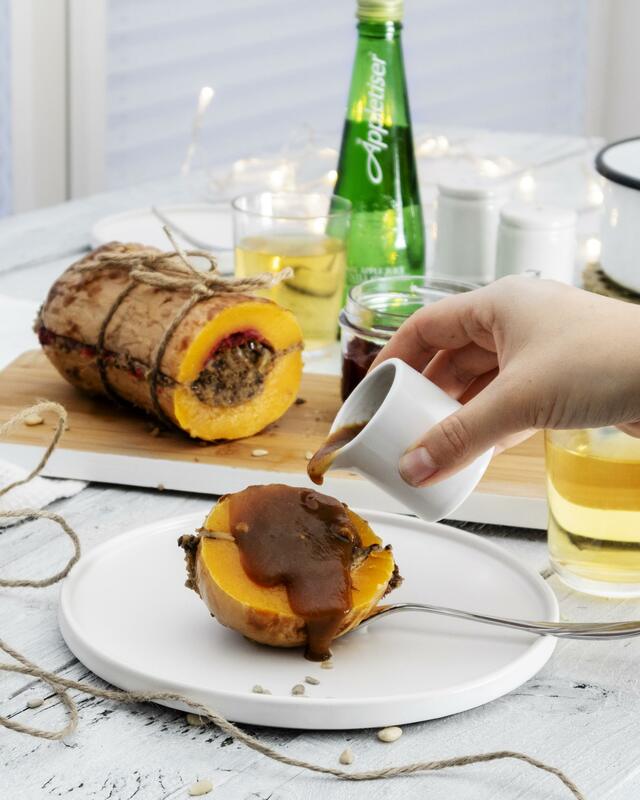 One of the things that excite me the most about Christmas is the seasonal food – besides wrapping Christmas presents, getting the Christmas spirit into the kitchen is one of my favourite activities in the advent time. 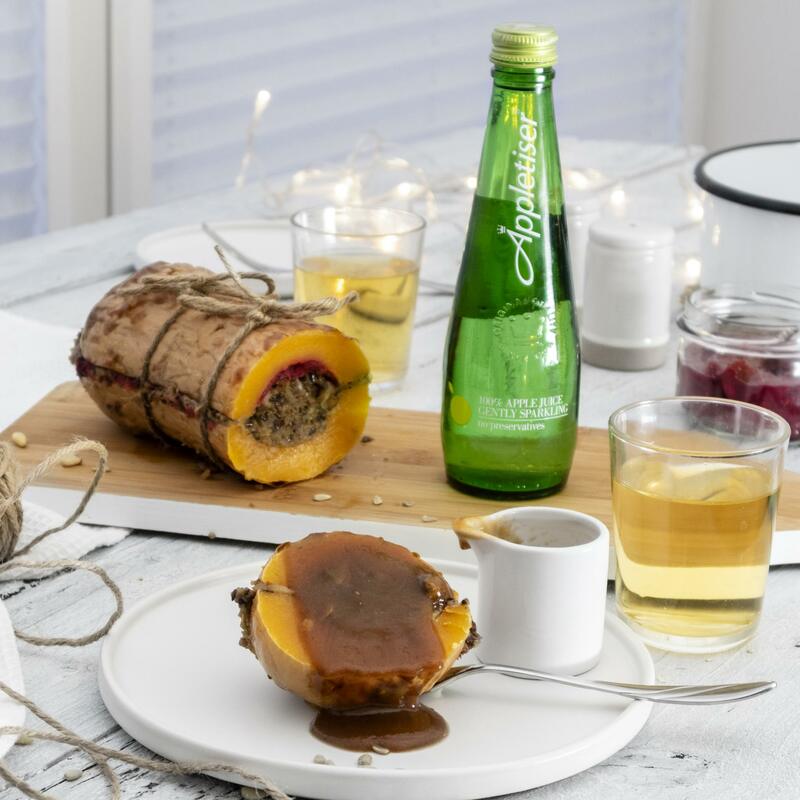 Traditionally the dishes my family used to create around the holidays were anything else than vegan (growing up in a German household after all! 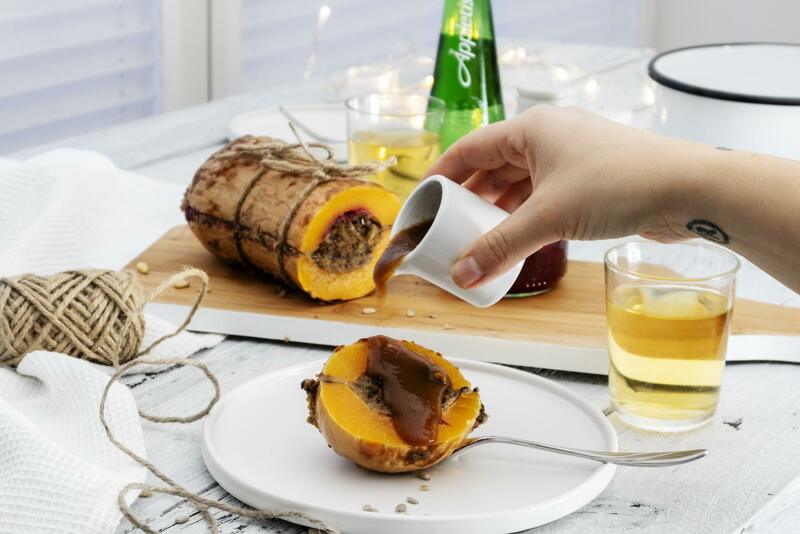 ), and the challenge to come up with new vegan dishes with a traditional twist, has been something that I’ve been loving over the past few years. 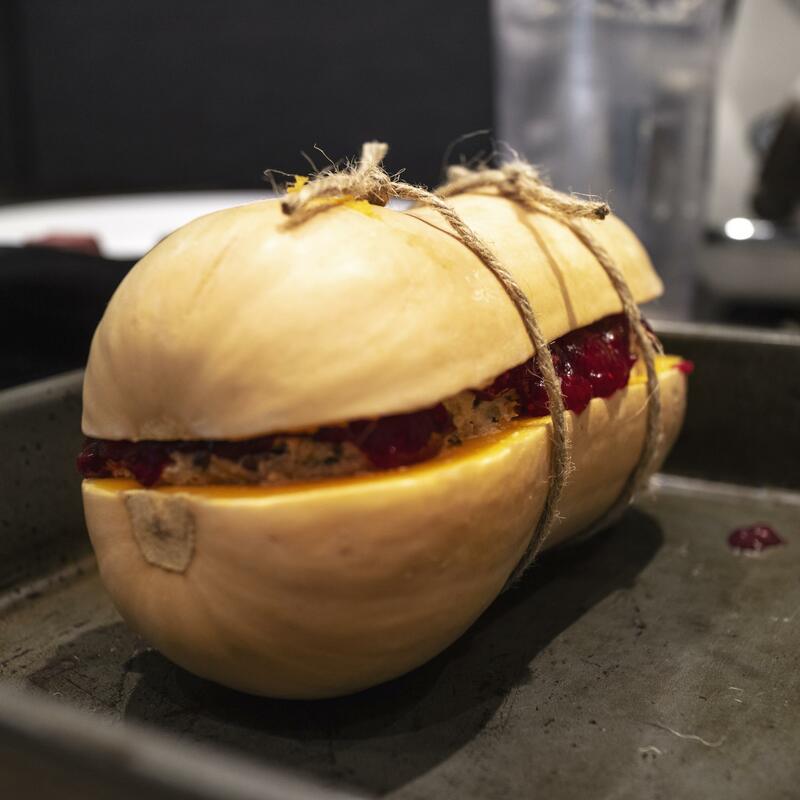 So what’s my twist on this stuffed squash? 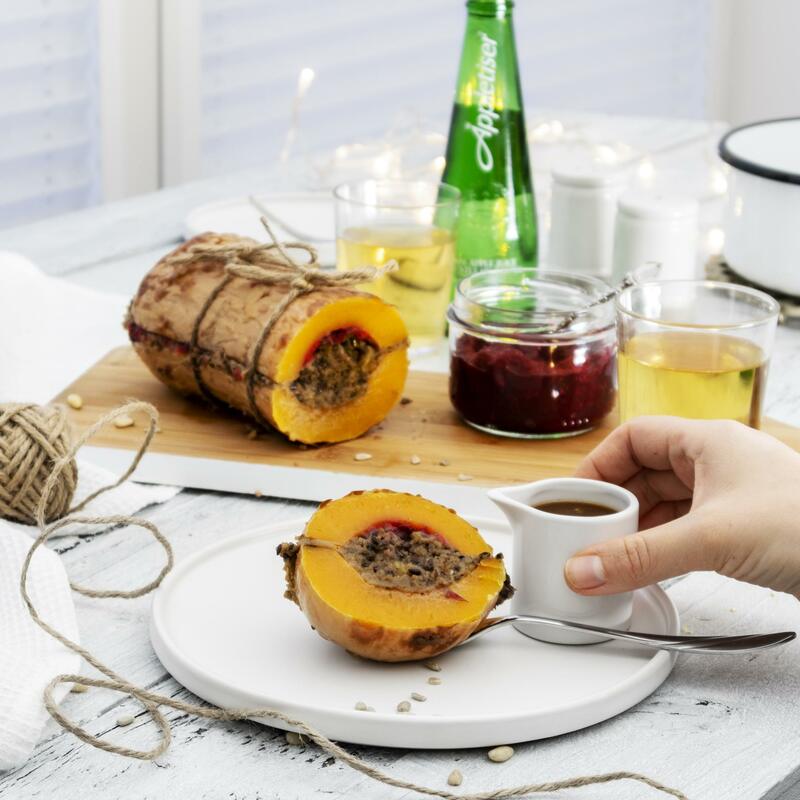 Well, firstly I have created a nut roast style filling for the roast – and therefore combined two of my favourite foods (I simply love a good nut roast and you probably know by now that I’m addicted to anything squash or pumpkin like!). 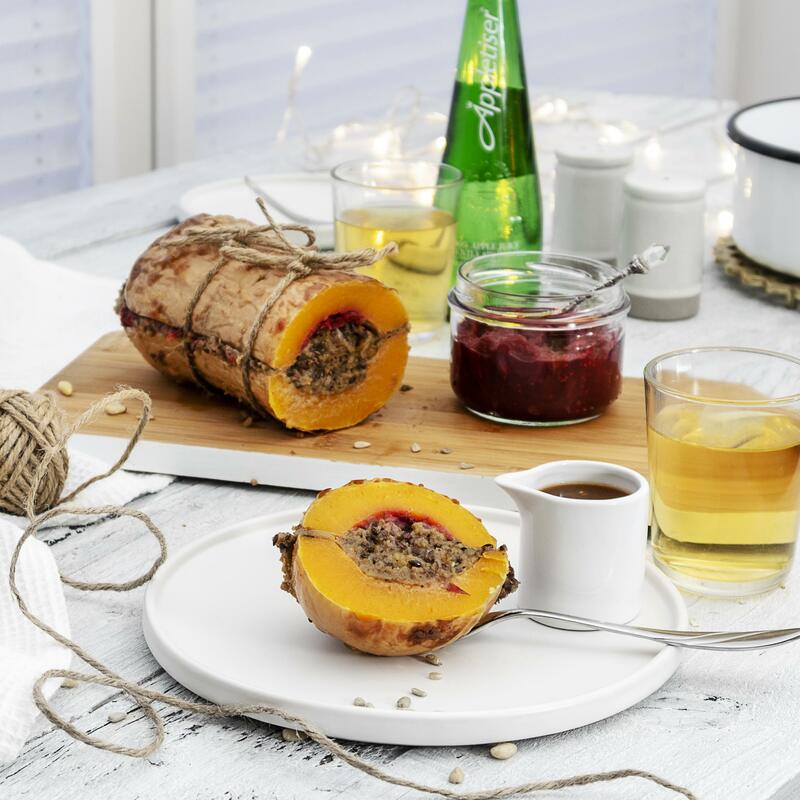 To add the Christmas feel into the dish even more, I have also added a homemade cranberry sauce – the natural sweetness simply compliments the savoury nut roast in a magical way. 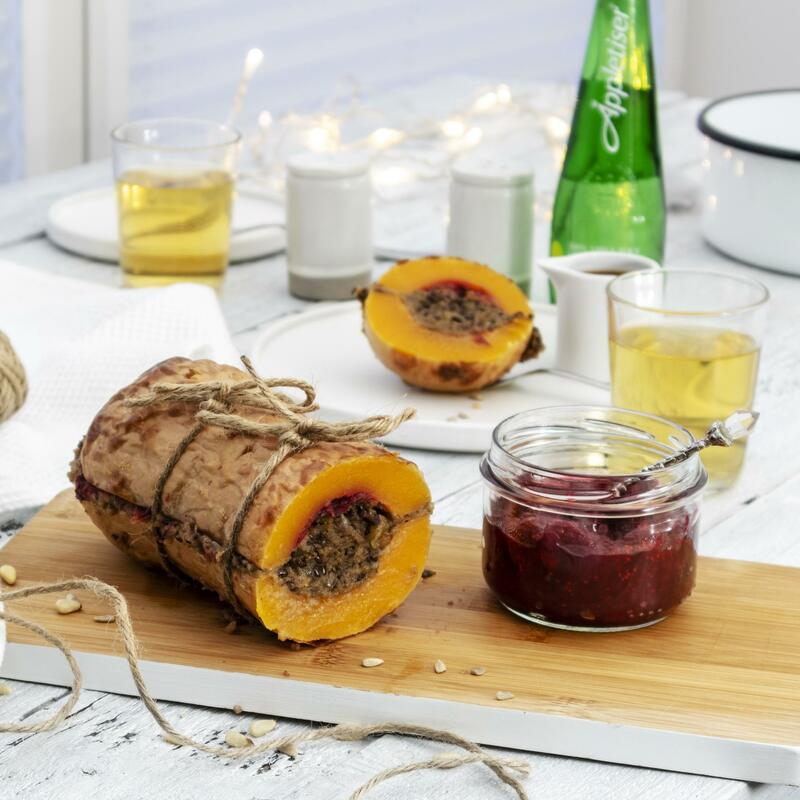 If you’re out of pine nuts, you can simply replace them with chopped walnuts, just ensure to not leave out the chestnut puree as it’s vital for the distinct taste of this roast. I know it’s a little more difficult to get hold off, but lots of supermarkets offer it around the Christmas period, and there’s always Ocado to order it from. 1. Add all seeds and nuts into a small frying pan and toast them for 2 minutes over medium high heat. Make sure to stir constantly so that they get toasted evenly and don’t burn. 3. 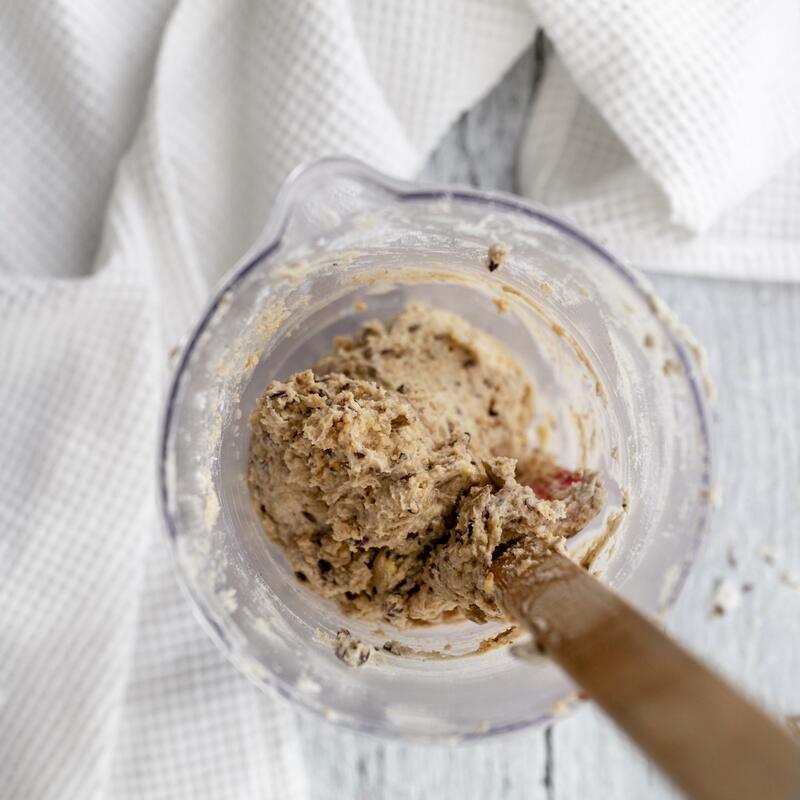 Stir the almond flour into the nut mix until you get a sticky texture and set aside whilst you prepare the cranberry sauce. 4. 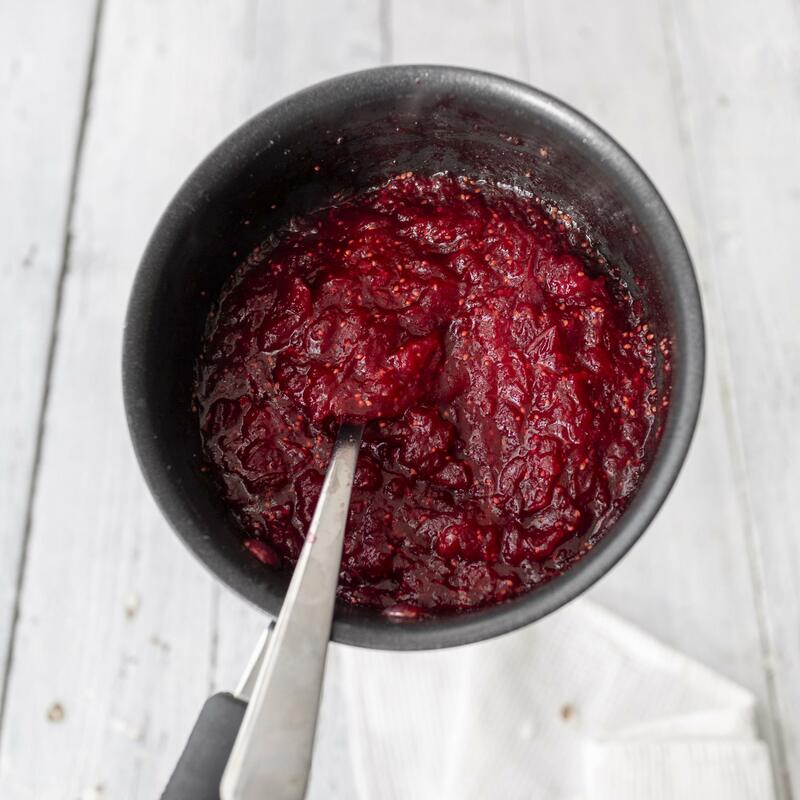 Add the cranberries to a sauce pan over medium heat and pour in about 30ml water to ease the heating process. Cook the cranberries until they start to steam, then start squashing them with the back of a fork. Stir regularly until the sauce thickens as the liquid evaporates. Add in the maple syrup (if using) and freshly squeezed orange juice and set aside. 5. 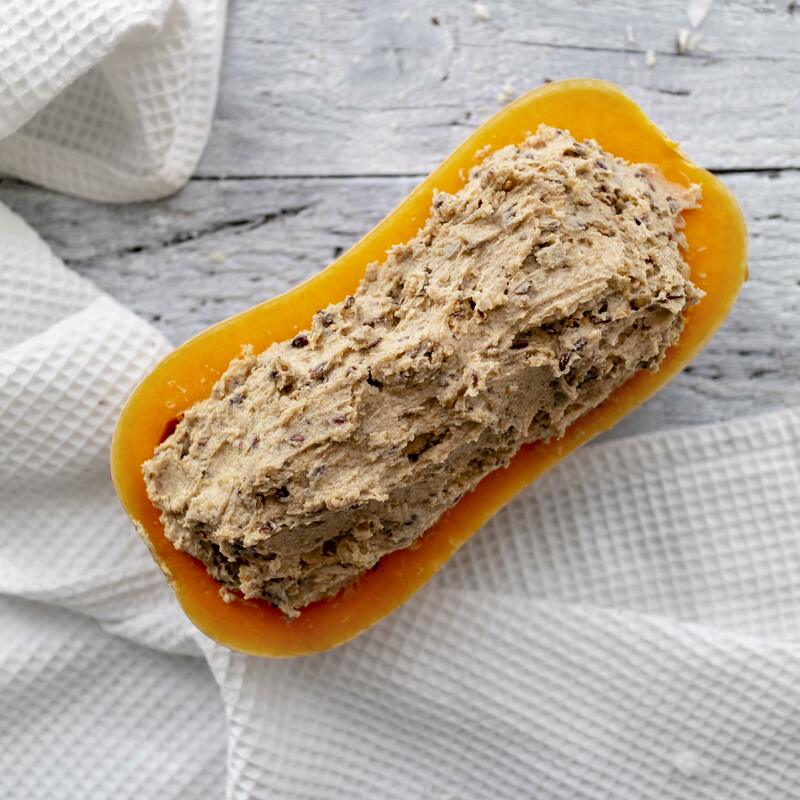 Preheat your oven to 200 degrees , then wash & cut the butternut squash lengthwise in half hollow out the halves – this is where our filling will go. 7. Add the second squash half on the top and use ovenproof ribbon to hold the parts together. 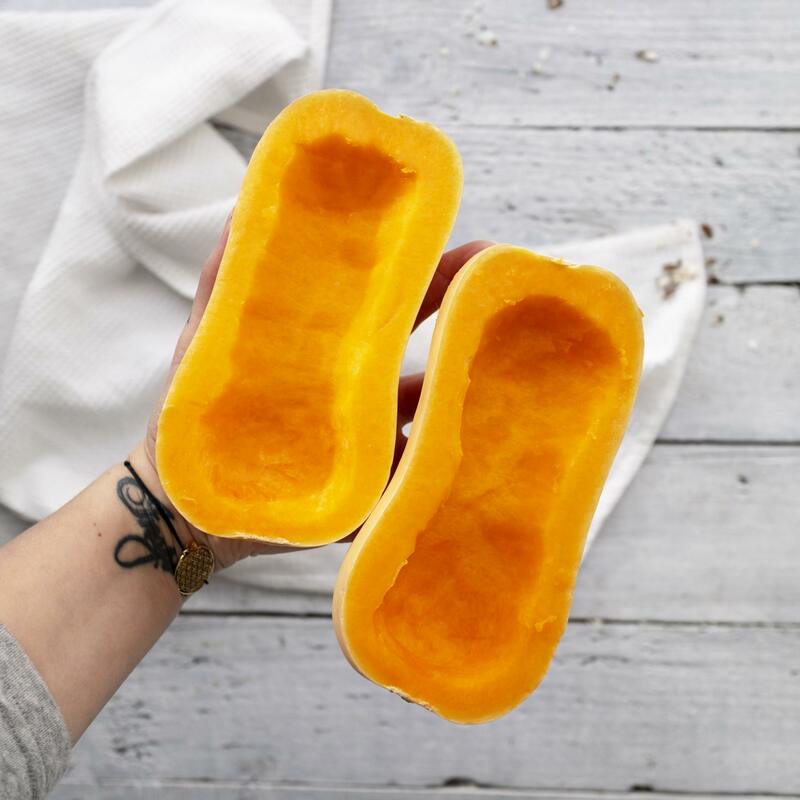 I would also recommend poking 2 long toothpicks through the squash to keep it in place – most squashes can get a little slippery/uneven when heating and the picks will help the squash halves stay in place during the roasting process.